These were to cute not to share! In a large bowl, cream the shortening, butter and sugar until light and fluffy. Combine the flour, baking powder, baking soda, salt and nutmeg: add to the creamed mixture alternately with sour cream. Cover and refrigerate for 2 hours or until easy to handle. 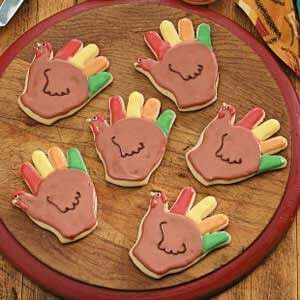 Use a floured hand-shaped cookie cutter or trace a child's hand onto a piece of cardboard with pencil and cut out for a pattern. On a well-floured surface, roll out dough to a 1/2-in. thickness. Either use a sharp knife to cut around the cardboard hand pattern in dough or use cookie cutter to cut out hand shapes. Place 2 in. apart on ungreased baking sheets. Bake at 425° for 7-9 minutes or until lightly browned. Remove to wire racks to cool. In a small bowl, combine the glaze ingredients and beat until smooth. Set aside 1 teaspoon of white glaze for eyes. Place 1/4 cup of glaze into each of four bowls. Tint one red, one yellow, one orange and one green. Place 1 tablespoon of glaze in another bowl and tint dark brown. Tint the remaining glaze light brown. Frost the palm and thumb of each cookie light brown. Frost each finger a different color, using red, yellow, orange and green. Place the remaining yellow glaze in a pastry or plastic bag. Cut a small hole in the corner of bag. Pipe a beak on each thumb. Repeat with dark brown glaze to pipe a pupil in the center of each eye and to pipe wings in the center of each cookie. Use remaining red glaze to pipe wattles on each thumb. Let dry completely. Yield: about 3 dozen.